Happy New Year Friends! Congrats you made it through the second week of January. Have you hit the reset button on your health? If your resolution is to eat healthier than this salad is for you. Because after all those cookies in December who doesn’t need a fresh new salad recipe. This salad is vibrant, simple, full of flavour and healthy. 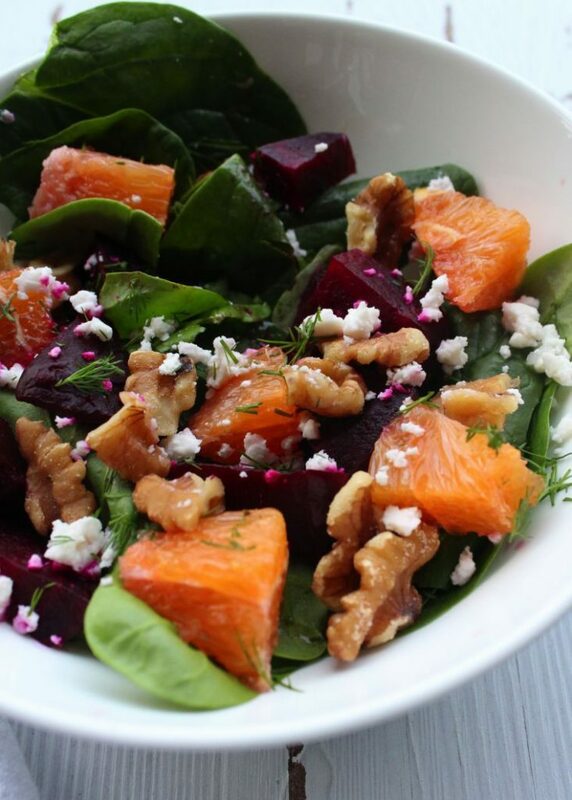 We love roasted beets and with it being orange season I thought I would combine the two for this delicious roasted beet and orange salad. 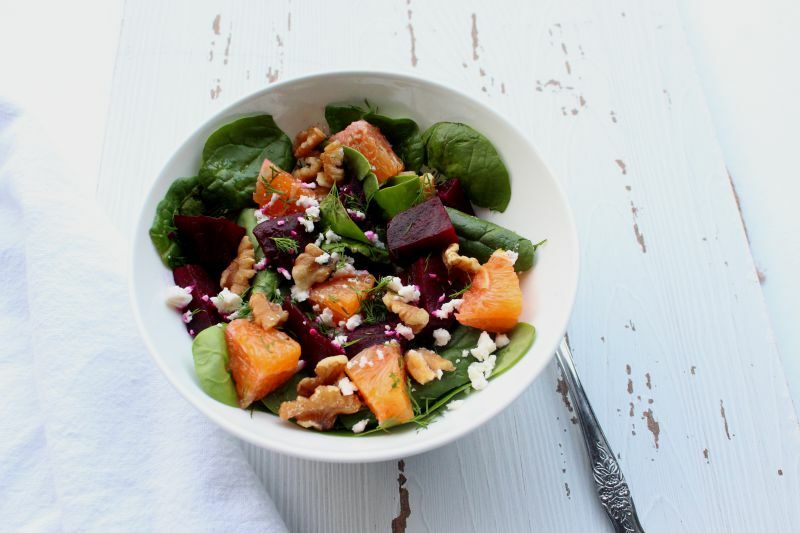 We eat a lot of roasted beets, this roasted beet and carrot salad makes a regular appearance during the fall and winter months. They take a little while to roast but are worth the time. Besides being full of antioxidants, beets are a source of fibre, folate, vitamins and minerals. 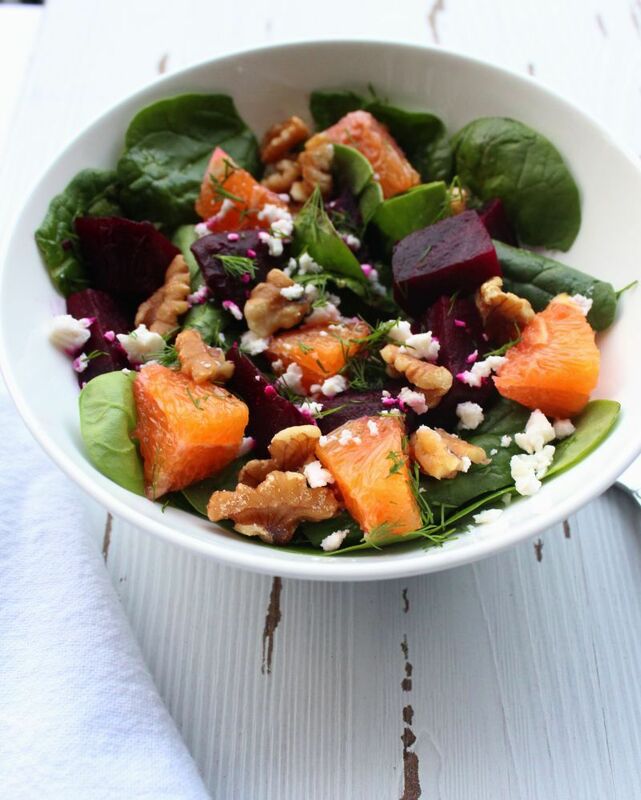 Anthocyanins, the pigment that is responsible for giving beets vibrant color, is full of antioxidants. In addition to anti-inflammatory and cancer fighting properties beets contain betaine which have anit-aging properties and aid in the liver detoxification process. Beets are extremely versatile, you can add them to smoothies, pancakes, hummus, and veggie burgers. Not only do I love salads because they are healthy, but I also love how versatile they are. I added dill to this recipe because I wanted to use up the dill before it went bad but you could easily swap it for parsley. If you are looking to make this a salad a stand alone meal I would add quinoa or another grain like farro as well as a protein such as a salmon fillet or grilled tofu. Let me know if you have any other suggestions for this great salad. Roast beets in tin foil for 45-50 minutes. In a large bowl gather spinach, oranges, walnuts and dill. Whisk salad ingredients together, and set aside. Once beets have cooled, chopped them in quarters and add to salad.